John of Matha was born in the Year 1160 at Faucon in Provence on the Feast of St. John Baptist. His parents, who were considerable both for their virtue and rank in the world, took a particular care to give him a religious education. His childhood was full of manly virtues; his modesty, sweetness, prudence, and innocence engaged the affections of all that knew him. He made his first studies at Aix the Capital of Provence, and there learned fencing, riding, and other genteel exercises. But none of those gay amusements broke in upon his virtues. What money his parents allowed him for his pocket was distributed amongst the poor; and at an age which usually abounds with levity, and a false niceness proceeding from pride, and want of compassion, he visited the hospitals once a week, and took a singular pleasure in binding up and cleansing the wounds of the patients. Thus he spent his first years, in acquiring such learning as was suitable to his age, and practising those virtues which make the brightest part of the character of a Saint. At his return from Aix he retired to a little hermitage near Faucon; but finding he could not enjoy the solitude he longed for so near his relations, to whose conversation he was exposed, he got leave of his parents to study Divinity at Paris. His capacity and application distinguished him in that learned University, where he passed all his degrees with applause. Here he was ordained Priest, and said his first Mass in the Bishop's Chapel, where he was honoured with the presence of the Maurice Bishop of Sully, the Abbots of St. Victor and St. Genevieve, and the Rector of the University. But this was an inconsiderable favour in comparison of another that he received at that time. For it was then that God opened to him his particular vocation, and while employed in offering the Price of our Redemption, gave him the first thoughts of employing his time and care for the relief of Christians oppressed with slavery. But he thought himself obliged to consult the will of God in silence, and prepared himself for the execution of so great and glorious a design by prayer, and penance. While our saint was considering on a place proper for those pious employments, he remembered he had heard of Felix of Valois, that lived in a Wood near Gandelu in the Diocese of Meaux, and was famous for sanctity and penance. Persuaded that holy hermit would be a proper master for him, he begged to be received into his Hermitage, and favoured with his instructions. Felix entertained him, according to his desire, and looked upon him as one sent by Divine Providence for his benefit and improvement. Here they lived in the constant practice of such Virtues as are to be expected from those that live for heaven only. Fasting and other austerities were their whole business; prayer, and contemplation their ordinary employment; and their conversation always tended to excite one another to the love of God. 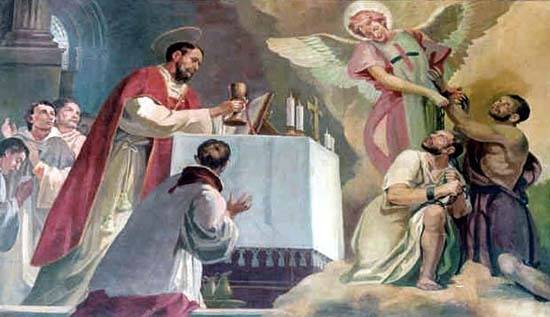 After some time thus spent together, John communicated to Felix the pious design he had conceived at his first Mass; and enlarged upon the necessity and advantage of such an undertaking. He did this in so moving and strong a manner, that Felix was persuaded the proposal came from God; and offered to join him in the execution of it. They entered into the particulars of this great work, and finding it attended with many difficulties, prepared themselves for it by three days strict fast and continual prayer; and then set out for Rome in order to consult the Pope about the matter. They began their journey in the dead of winter 1197, and reached the City in January following. Innocent the III was then just raised to the Holy See. Upon reading their letters of recommendation from the Bishop of Paris, and the Abbot of St. Victors received them like two angels sent from heaven, and gave them an appartment in his own Palace. They had several audiences of his Holiness, in which they explained their whole design. The Pope called his Cardinals and some bishops together in St. John Lateran's, Church, laid the proposal before them, and desired the assistance of their advice in this important affair. After this consultation, his Holiness ordered a fast, and some particular prayers to be offered up Feb. 8 upon this occasion; and having thus recommended the business to God, gave them leave to erect a New Order, which should be under the direction of the Saint, who was first favoured with the Design. The Bishop of Paris, and the Abbot of St. Victor were employed in drawing up the Rules, which the Pope approved of, with some few additions, by a Bull dated December 17, 1198. Those,that are admitted into this Order, are to wear a white habit, with a red and blue Cross on the breast; and devote a third part of their substance to the redemption of slaves. All their churches are to be dedicated to the Holy Trinity. This Order afterwards took the name of Mathurins, from an old Church dedicated to that Saint at Paris, and given to them about thirty Years afterward. When things were thus settled, the two holy hermits returned to France, where Philip was then King. Upon their report of what had passed at Rome, his Majesty allowed them to set up their Order in his Kingdom; and contributed very largely toward the good work. After founding several houses in his own Country, he left the care of them to his companion in that pious undertaking, and went to Rome; where he obtained of the Pope a monastery for his Order on Mount Celius. His Holiness had wrote to Mirammolin, King of Morocco, the Year after this new Order was formed, desiring him to second the charitable designs of the Trinitarians, who would either pay the ransom of his Christian slaves, or give an equal number of his subjects that were detained in Italy, France, and Spain, in exchange for them. In Consequence of this application in the Year 1200, John sent two of his Religious in that Kingdom, on that errand. Their success was answerable to the purity of their intention, and they redeemed 186 Christians. The year following he went into Barbara and there purchased the Liberty of 110 Slaves. From thence he returned into his own Country, where he met with very considerable encouragement and assistance in his charitable designs. After that he went to Spain; where the large contributions of Princes and men of the first rank enabled him to build several Monasteries of his Order. About nine years after his first voyage to Barbary, he made a second to that country, and brought away 120 Captives.